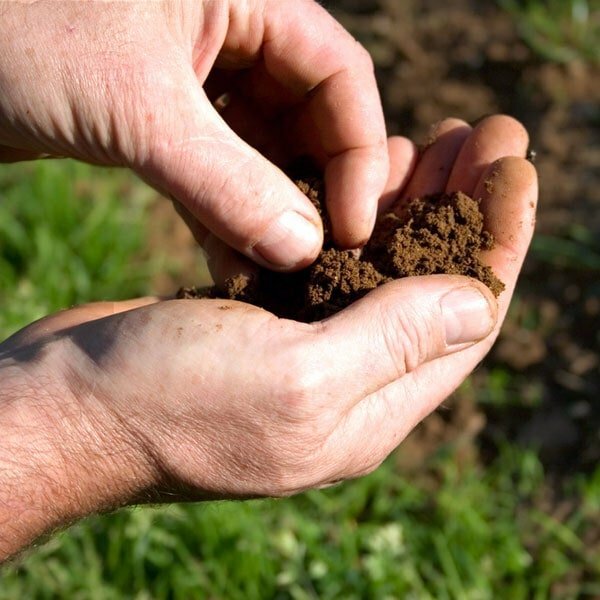 The physical properties — your compost pile’s size, temperature, moisture content and particle size — that determine success. 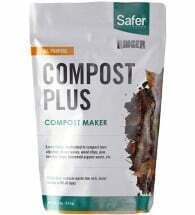 If you’ve ever read anything about composting, you’ve read that small particles will compost more quickly than big ones. This is because the micro-organisms that do the work can only get at the outside of a particle. The more surface area they can reach, the quicker they can do their work. Small particles, having more surface area for their volume, decompose more quickly. As a result, temperature will shoot up rapidly in a newly-constructed hot heap if the ingredients are small. So particle size can influence how fast the pile temperature rises and how long the entire composting process takes. However, it does not determine whether composting will happen. It only influences the rate at which it happens. 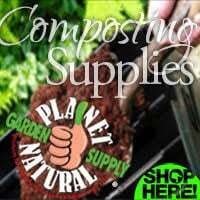 Convert kitchen, yard and garden waste into soil-nourishing organic matter with our backyard tested compost bins, tumblers and supplies. 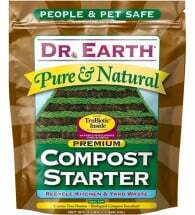 Decreasing household waste and building your soil has never been so easy! Pile size and shape also influence composting rates and temperatures, again through the ratio of inside volume to outside surface area. But whereas the goal with particles is to maximize contact with their environment (by maximizing their surface area), the goal with piles is precisely the opposite. All composters who work with heaps (as opposed to sheet or trench composting) know in their bones that the environment inside the pile should be independent of the environment outside it. The temperature inside an active pile will barely change overnight even if the air temperature drops by forty degrees. And – ideally – a pile should not be soaking wet even after three days of heavy rain. This independence is achieved in part by minimizing contact between the pile and the air around it, in other words, by minimizing the pile’s surface area. Translated into practical terms, this means that at least up to a certain point, bigger is better. Below a certain size, a pile simply won’t heat up significantly because too much of it is exposed to the cooler air surrounding it. As it gets bigger, volume and surface area will both increase, but the volume will increase more quickly. Imagine a 6-inch tall pile of compost-bound refuse on the ground. 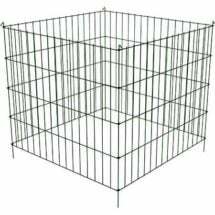 For convenience sake, we’ll pretend that it has perfectly square corners, vertical sides and a flat top that measures a yard square. The sides of this pile measure a total of 864 square inches (6 x 36 x 4) while the top measures 1,296 sq. inches (36 x 36). The total area of the pile is therefore 864 + 1296 = 2160 sq. in. Now imagine placing a second pile, exactly the same size and shape, on top of the first so that the corners and sides line up. This doubles the area of the sides, but the top remains unchanged. The total exposed surface area is now 2160 + 864 = 3,024 square inches. Though the volume has doubled, the surface area has increased by under a half. Since its surface area to volume ratio is so much smaller, this second pile will hold heat far more efficiently than will the first. In general, the larger the pile, the lower its surface-area to volume ratio. So what limits the size of the heap? Three things. First, manageability. There’s a point at which a pile simply becomes unmanageably large, at least if you’re turning it by hand. The second issue is weight. An excessively large pile bears down on its bottom layers inhibiting air circulation. Such a pile is likely to go anaerobic. Finally, even if you manage to turn it frequently enough to keep it aerated, a large pile could heat up enough to kill off some of the micro-organisms you probably want to add to your soil. One reason commercial, agricultural and municipal composting systems reach such high temperatures is that they are so large. As composting materials break down, the pile shrinks. Some of this shrinkage occurs simply because contents settle and compact under their own weight. But as the composting process cuts materials into smaller and smaller bits, they pack against each other more and more efficiently, taking up less and less room. In general, a finished pile is only a quarter to a third the size of the original pile. Since aerobic microbes require oxygen, efficient air flow is essential to a good pile. But too much surface area, or too much air circulation, cools a pile down. If you want a hot pile, then, you’ll need to strike a balance between oxygen supply and temperature. Efficient decomposition can only occur if sufficient oxygen is present. The Yard Butler® Compost Turner is an effective way to add oxygen and bring microbes into contact with newly added material. Piles that are not aerated may produce an unpleasant odor that’s symptomatic of anaerobic decomposition. 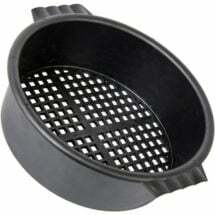 Mixing with an aeration tool‎ keeps it fresh. The easiest way to ensure an adequate oxygen supply is to maximum surface area; however, conserving heat requires minimizing it. It is extremely difficult to build a pile which achieves a true balance between these two competing requirements. Occasionally someone does come up with the specs for a hot, self-oxygenating pile; a hot pile that does not need turning or frequent aeration. Such a system usually involves elevating the pile somewhat to allow air to flow in from beneath it, and some additional way to aerate the center of the heap. This can be achieved by building it around perforated pipes, poking air holes after initial construction, or even mechanical aeration using fans or forced air. Instead, most back yard piles employ a sort of see-saw approach. The pile swings first towards high temperature, then towards aeration and then back again until the composting process is over. The working arrangement here is to start by giving temperature priority. 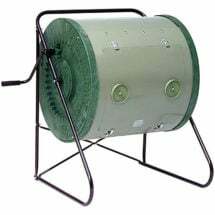 The composter tries to minimize surface area so as to encourage microbial proliferation and the attendant rise in temperature. When microbes at the center of the pile run out of oxygen, as they inevitably will, and temperature starts to fall, aeration takes priority. 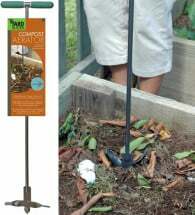 The composter turns the pile which amounts to maximizing surface area. As soon as this is done, the pile is reconstructed to minimize surface area and the see-saw swings back towards temperature maximization. This alternation continues until the pile stops heating up and is ready for curing. Like all living creatures, the microbes in a compost pile require water. Most thrive in a damper climate than would suit us. If the ingredients are initially saturated with water, further watering is unnecessary and will actually leach away some of the nutrients in the pile. This is why it’s a good idea to protect the pile from rain. In any pile exposed to air, the outer layer will tend to dry out. That dry outside layer does perform an important function — it insulates the inside from the cooling, drying air — but it will not itself break down very quickly. One of the main by-products of microbial activity is heat. Microbial activity raises the temperature of a compost pile. The bacteria to begin the composting process are the psychrophilic, active at 50-70°F (10-21°C). 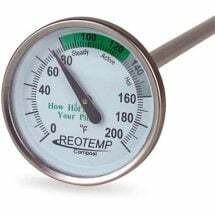 If conditions are right, the temperature rises and the psychrophilic bacteria shortly pass the baton to the mesophilic bacteria, which operate at 70-100°F (21-38°C). In a poorly oxygenated pile or one that lacks sufficient nitrogen to support a high microbial population, the temperature of a compost heap may hover here for months. Many continuous piles (where new material is constantly tossed on top but the pile is not turned) never rise above this range. However, if conditions are good — plenty of oxygen, moisture and nitrogen — the temperature continues to rise to the point where the thermophilic bacteria begin to operate. These can raise the temperature to 140°F (60°C) degrees or more. How long it stays this high depends largely on its size. In a back yard pile, thermophilic bacteria can keep a pile at 130-160°F (54°-71°C) for several weeks, as long as it is periodically turned to introduce new oxygen. Big agricultural or municipal systems can reach higher temperatures and maintain them longer than backyard heaps simply because they are larger. It takes the thermophilic bacteria longer to eat through them. The high surface-area-to-volume ratio also favors high temperatures. Cornell University’s Compost Physics page offers a clear explanation of the three processes — conduction, convection and radiation — by which a hot pile can lose heat during the thermophilic stage. Pile size, shape and the resulting ratio between surface area and volume (discussed above) largely determine the extent to which these lower the temperature of a hot pile. A hot pile cools down when it has run out of fuel. The thermophilic bacteria can no longer find enough carbon to support them in the dense concentrations necessary to maintain the pile at its peak temperature. One other observation about temperature needs to be included here. When temperatures in a pile drop below freezing, microbial activity stops. However, the alternation of freezing and thawing that occurs in many cold-climate piles during the autumn and early spring will continue to break down materials physically. Freezing water cracks, pries and breaks organic matter just as it will rock or cement. When the material thaws, water flows into new crevices where, as it freezes, it will exert pressure on new points. This process is not the biological and chemical process of decay. It’s the physical splitting of leaves, twigs and apple cores into smaller pieces. And as has been mentioned many times, smaller pieces decay more rapidly. The freeze- thaw cycle does not chemically change any of the constituents in the pile. But it does prepare the way for swifter decay once warmer temperatures return with the spring. Includes the microbes needed to speed up the decomposition of raw organic materials.